Saint Elmo also know as Erasmus of Formiae a the Roman Catholic Saint, martyr who died ca. 303. Venerated as the patron saint of sailors. 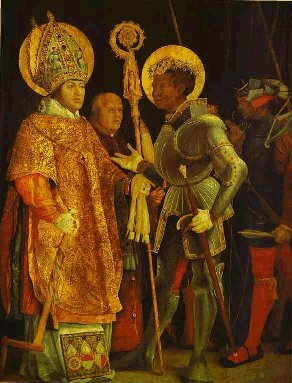 He is also one of the Fourteen Holy Helpers, saintly figures of Christian legend venerated especially in Europe as intercessors. "Acts of Saint Elmo" were compiled from legends that confuse him with a Syrian bishop Erasmus of Antioch. Jacobus de Voragine in the "Golden Legend" credited him as a bishop in Formia over Italian Campania, as a hermit on Mount Lebanon, and a martyr in the persecutions under Eastern Roman Emperor Diocletian. when the persecutions of the Emperor Diocletian began, Erasmus was called before a judge, beaten around the head, spat upon and 'besprinkled, with foulness.' He was then beaten with leaden mauls until his veins broke and burst. Erasmus suffered all of these punishments with tremendous willingness. Erasmus was then thrown into a pit of snakes and worms, and boiling oil and sulfur were poured on him but 'he lay therein as he had lain in cold water, thanking and loving God. Then thunder and lightning came and electrocuted everyone around saving him. Thus the saint was protected from the lightning. Diocletian had him thrown in another pit, but an angel came and slew all the vipers and worms. The Western Roman Emperor Maximian was "much worse than was Diocletian." he would not cease preaching the Gospel, even though he was "put into a pan seething with rosin, pitch, brimstone lead, and oil, a then poured into his mouth, from which he never shrinked." A searing hot cloak and metal coat were both tried on him, to no effect, and an angel eventually carried him away to safety." "And when this holy man came before the false gods" - to which he was to be forced to sacrifice, they "fell down and broke all in pieces, and consumed into ashes or dust." That made the emperor so angry he had Erasmus enclosed in a barrel full of protruding spikes, and the barrel was rolled down a hill. But an angel healed him. Further tortures ensued:His teeth were ... plucked out of his head with iron pincers. And after that they bound him to a pillar and carded his skin with iron cards, and then they roasted him upon a gridiron...and did smite sharp nails of iron in his fingers, and after, they put out his eyes of his head with their fingers, and after that they laid this holy bishop upon the ground naked and stretched him with strong withes bound to horses about his blessed neck, arms, and legs, so that all his veins and sinews that he had in his body burst." The version of the "Golden Legend" did not relate how Erasmus fled to Mount Lebanon and survived on what ravens brought him to eat, an interesting pre-Christian mytheme. When captured, then brought before the emperor and beaten and whipped, then coated with pitch and set alight as Christians had been in Nero's games, and still he survived. Thrown into prison with the intention of letting him die of starvation, Saint elmo managed to escape. He was recaptured and tortured some more in Roman of Illyricum, after boldly preaching and converting numerous pagans to Christianity. Finally, according to the legend, his stomach was slit open and his intestines wound around a windlass. This late legend may have developed from interpreting an icon that showed him with a windlass, signifying his patronage of sailors. He become the patron of sailors because he is said to have continued preaching even after a thunderbolt struck the ground beside him. This prompted sailors, who were in danger from sudden storms and lightning, to claim his prayers. The electrical discharges at the mastheads of ships were read as a sign of his protection and came to be called "Saint Elmo's Fire". Erasmus is invoked against colic in children, intestinal ailments and diseases, cramps and the pain of women in labor, as well as cattle pest.